Daytona 500 postponed to Monday, The Daytona 500 has been postponed for the first time in its 54-year history. 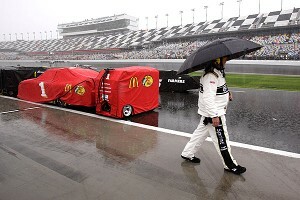 NASCAR postponed The Great American Race after heavy rain saturated Daytona International Speedway on Sunday. But Monday may be another test for both drivers and fans. The forecast calls for more rain, and officials are prepared to wait all day and into the night to avoid a Tuesday race. The last shortened Daytona 500 was Matt Kenseth's 2009 victory, when rain stopped the event 48 laps from the finish. He was declared the winner while the cars were parked on pit road. Now, NASCAR will have to deal with the downside of moving its biggest race. Ratings and attendance will suffer, and its showcase event won't get the audience the series expected. The opener will feature several intriguing story lines for a racing series trying to capitalize on the success of last season's captivating championship race. She arrived at the pre-race driver meeting Sunday with three-time NASCAR champion Tony Stewart, the owner of her Cup car. Stewart is trying to snap an 0-for-13 losing streak in NASCAR's biggest race of the year. Stewart's 17 victories at Daytona include everything but the 500, ranking him second on the all-time list behind the late Dale Earnhardt's 34 wins. Stewart will start third when the race goes green.